The vast and extraordinary collections from the Pacific, collected from the late eighteenth century onwards, that are dispersed across ethnographic and other museums in Europe amount to hundreds of thousands of artefacts, ranging from seemingly quotidian and utilitarian baskets and fish-hooks to great sculptures of divinities, architectural forms and canoes. Alongside the works themselves are rich archives of documents, drawings by early travellers, and often vast photographic collections, as well as historic catalogues and object inventories. These collections constitute a rich and remarkable resource for understanding society and history across Indigenous Oceania, cross-cultural encounters since the voyages of Captain Cook and his contemporaries, and the colonial transformations of the nineteenth century onwards. These are also collections of profound importance for Islanders today, who have varied responses to their displaced heritage, and renewed interest in understanding ancestral forms and practices. 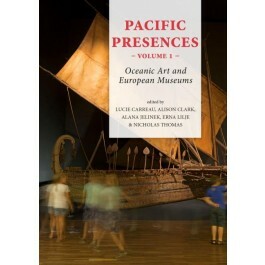 This book, in two volumes, not only enlarges understanding of Oceanic art history and Oceanic collections in important ways, but also enables new reflections upon museums and ways of undertaking work in and around them. It exemplifies a growing commitment on the part of curators and researchers, not merely to consult, but to initiate and undertake research, conservation, acquisition, exhibition, outreach and publication projects collaboratively and responsively. Volume one focuses on the historical formation of ethnographic museums within Europe and the development of Pacific collections within these institutions.